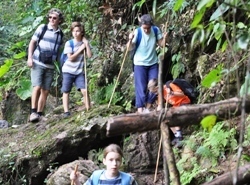 This trekking adventures on Ba Be jungle takes you into the remote jungle on the western side of Ba Be National Park and gives you the opportunity to experience the real jungle. It is for people with at least moderate to good fitness levels and a good spirit of adventure. Ba Be Lake is situated in Bac Kan province which is 240 km northeast of Hanoi Capital. On the way to Ba Be we will pay a visit to the Thai Nguyen Minority and Culture Museum where we can learn something about the culture and traditions of the different minority groups in Vietnam. Lunch will be in a local restaurant and onwards to Ba Be Lake. We arrive early in the afternoon, take a rest, have dinner and stay overnight in a local Tay minority family in their traditional wooden stilt house. Agree at day for trekking!! Your tour guide will first take you to visit the Coc Toc village where the Tay people live by fishing. After crossing the Pelu stream, you will then have some rough terrain to navigate, but as you gain height your efforts will b e rewarded by spectacular views. Going on further to the uplands we will stop in H’mong ethnic – 1 village (Cash Dao people) where we will have a picnic lunch. In the afternoon the guide will take you through mountains and valleys and to see the stilt houses and school of the Cash Dao people, continuing on the trail to visit H’mong ethnic – 2village. 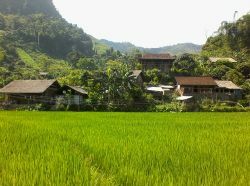 Then, you will have a dinner in local homestay and spend the night at Dao Ethnic – 1 Village. But you must be careful if they are generous with their corn wine! Breakfast at Homestay before saying “goodbye” to the Cash Dao people. You will set off on trails to visit H’mông ethnic – 3 village then go down through the forest to visit Dau Dang waterfall which lies on the border of the two provinces of Bac Kan and Tuyen Quang. After that you will have a lunch with ‘Mr Pirate’ who is main actor in “Ba Be Lake Pirate Movie”. Then you will take a boat trip up the river to visit the Puong cave, home of thousands of bats (of 18 different species) and famous for its many stalactites and stalagmites The river actually runs through the cave into Ba Be lake. After visiting the An Ma temple, you will return the lake shore. Dinner and overnight at Bo Lu homestay..
A clean and comfortable home stay with mosquito nets provided. Add: 22 Hang Be, Hoan Kiem District, Hanoi, Vietnam. This entry was posted in Ba Be Lake, Tour in the North of Vietnam, Trekking tours.